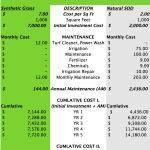 Artificial Turf vs. Natural SOD Cost Analysis - Lawn Kings Inc.
Rather than writing paragraphs and paragraphs we’re thinking we’d like to show you the money – so to speak. 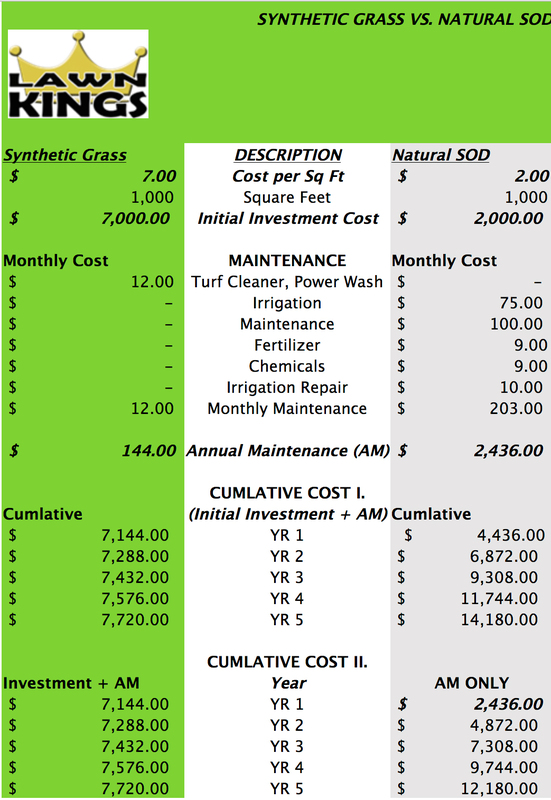 Please see the figures presented below for an analysis Synthetic Grass Cost / Artificial Turf Cost vs. Natural Sod. Conservatively, you can expect to break even on your investment in synthetic grass in 4 or 5 years. One real world item to consider is, in our experience and maybe yours as well, is that we have completed projects where homeowners and commercial property owners/managers have replaced the natural sod in their yards or areas; 2, 3, 4, and yes even 6 times (that was over a sixteen year period). We are always happy to come out for a free synthetic grass estimate. Contact Lawn Kings, Inc. today!